The first issue is only AU$6 (plus postage) or AU$25 (postage included) for a yearly subscription within Australia. Living Vegan is a not for profit publication with the money from direct subscriptions going to Uproar Inc., the publishers of Living Vegan, to support vegan education campaigns. If you're a members of Animal Liberation Victoria, Animal Rights Advocates, Uproar or Vegan Society NSW you will automatically be subscribed to Living Vegan magazine to recieve Living Vegan four times a year. The team involved in putting the magazine out include: Editor - Noah Hannibal (also known as Vegan Tank in many circles), Deputy Editor - Jane Daly, Art Director - Erik Gorton, Copy Editors - Anna Angel, Jamie Yew, Health and fitness - Fawn Porter, Vegan Cheat Sheet - Tanya Critchell. Notzeralla Test Drive, The 2011 Vegan Food Awards; Vegan Bush Tucker plus Recipes, the Vegan Cheat Sheet and more! The layout and the graphic design is great, thanks to Ethical Design with the magazine printed by Black Rainbow on 100% post consumer recycled paper using vegetable oil based inks. I look forward to the upcoming editions where there will be even more information and content! How long have you been planning to launch a vegan magazine? After Vegan Voice announced its closure earlier this year, so many people were very saddened and couldn’t believe it was really coming to an end. Many in the vegan community, myself included, had been loyal Vegan Voice subscribers. Not long after this terrible news, people all over the internet started suggesting that someone should take over Vegan Voice magazine or start a new one. Greg McFarlane, President of the Vegan Society NSW created a Save Vegan Voice Facebook event. There was a huge response. People offered ideas for contributions, offers to volunteer their skills in graphic design and advertising, and many made commitments to subscribe to a new magazine. After several months had passed it was clear that there was a lot of enthusiasm and interest in creating a new vegan magazine, but some coordination and planning needed to begin to get it off the ground. I decided to take on the planning and coordination of this new venture. With support from Greg McFarlane I created a simple survey and circulated it widely around the internet. I wanted to do the survey as a first task so that I could find out exactly what readers would like in a new vegan magazine. While I have been vegan for 6 years and have my own views and insights about veganism and the vegan community, I didn’t assume to know what Australian vegans would want in a new magazine. The response was incredible. Within 2 days we had over 400 responses to the survey. After a couple of weeks there were 800+ responses. How did the Living Vegan team come together? Noah and I quickly found out about each other once the survey began circulation. We got in touch over Skype and decided to collaborate right away. While I had started some planning, Noah and Erik had started their own planning, and were particularly advanced on the graphic design and style side of things. It was clear that there was a great mix of skills between us and we all shared the same level of enthusiasm and commitment to make a new magazine a success. We also had some additional enthusiastic helpers ready to go including, Fawn Porter, Anna Angel and Jamie Yew, and Tanya Critchell. With Noah and Erik both already running a successful graphic design business and having secured funding from Animal Liberation Victoria and Vegan Society NSW to cover printing costs for the first issue, we were off to a great start. We all shared a real enthusiasm for starting up a new magazine. We had the results of the survey to guide us on content and to reassure us that there would be interested readers out there once we launched. And with all of that coming together, the wheels were in motion. We had a very ambitious deadline – to launch the first issue for World Vegan Day in Melbourne. Many caffeine fuelled nights followed. You’ve questioned a lot of people within the Australian vegan and Animal Rights movement, what were the biggest surprises you had from the responses? Yes we had such a great response to the survey and we were able to identify some amazing contributors for the first issue too. We hope to follow up with many more people who answered the survey in coming weeks and months as we get ready for the second issue. We had people from all parts of Australia (both major cities and regional areas), New Zealand, Asia Pacific and the rest of the world fill out the survey. Over half of the vegans surveyed were newer vegans, having been vegan for 5 years or less. We canvassed a range of names: Vegan Australia, Vegan Village, Vegan Shift, Vegan Season, Vegan Quarterly, Vegan Vibe, Living Vegan, The Vegan Times, Vegan Scene, Vegan Social. Some of them (which will remain nameless) were not popular at all! And while there was some liking for Vegan Quarterly, Vegan Vibe and The Vegan Times, Living Vegan was the standout winner. What can people expect from Living Vegan and how does it differ from Vegan Voice, New Vegetarian and Natural Health and other similar magazines? The magazine offers a range of feature articles, and regular sections, including Not Your Typical Treehugger which introduces readers to real vegans in the community, from all walks of life, and in the process takes a sledgehammer to uninformed and incorrect prejudices about what it is to be vegan. The profiles feature information about how and why people have gone vegan, favourite foods and recipes, and stories about how going vegan has changed lives for the better. 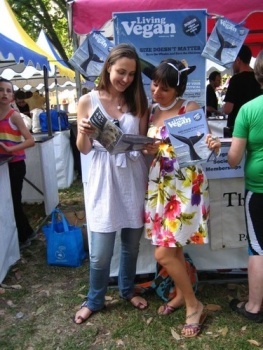 The Armchair Activist provides activities that people can get involved in to do more for animals. Not all people have the time or inclination to be outspoken activists. In this ongoing series we hope to inspire our readers with simple strategies that will encourage people to question how they treat animals. We’ll be providing non-confrontational ideas and resources to make activism just another part of your life. 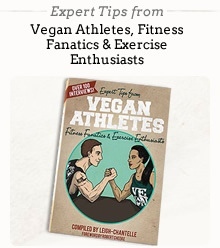 Also, the Vegan Cheat Sheet is a great offering of Living Vegan. Created to help shoppers avoid non-vegan products, it is a useful resource which folds neatly into your pocket. It will be updated quarterly in Living Vegan and online. Living Vegan will also be covering health and fitness, vegan products and businesses, books, films, music, and of course recipes! We are also offering a unique series called Vegan Bush Tucker that will be an ongoing guide to seasonal native Australian bush foods. The first issue introduces the Geebung, Australia’s very own custard berry. Do you believe that there is a large enough market for a vegan print magazine to be sustained in the long-term? Yes absolutely. We are pleased that already four organizations (Animal Liberation Victoria, Animal Rights Advocates, Uproar and Vegan Society NSW ) have signed on to provide the magazine as part of their memberships. 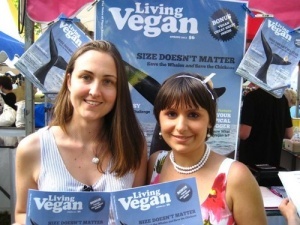 We will be selling Living Vegan in vegan restaurants, health food shops and other outlets. Of course, if you have a particular outlet in mind that would be suitable to sell the magazine we would love to hear from you. We want to know where are the best spots to put Living Vegan in public view to increase our readership and promote veganism at the same time. In the first issue we have tried to offer a bit of everything, but we encourage people to please check it out, discuss it with your friends, and get in touch to tell us more about what you want to read in Living Vegan. We really aim for this magazine to be a community venture – for vegans and by vegans, but still of wide appeal to vegans, vegetarians considering veganism and those just browsing. Our longer term plan is to provide an iphone application and/or a digital version of the magazine. How did each of your backgrounds prepare you for working together on a vegan magazine? Noah has been a vegan for over twenty years and has been involved in animal rights for as long as he can remember. He has taken part in rescues and investigations around the world, including the protection of whales in Antarctic waters. His animal rights photographs have been instrumental in winning numerous campaigns. He enjoys taking a sledgehammer to vegan stereotypes, and to that end recently won gold in the Australian Bench Press Championships, competing in the heavyweight division. Noah is also co-owner of Ethical Design, a creative agency dedicated to helping non-profit organizations and socially responsible businesses. Erik Gorton, co-owner of Ethical Design, has been vegan for over 16 years and has regularly donated his time and talents to various animal rights organizations. A former university lecturer and computer graphics animator for television shows, Erik now creates web and print design solutions that not only look stunning, but are invaluable tools in the promotion of social justice campaigns and ethical products and services. I have a background in sustainability research and writing. I’ve been vegan for 6 years now. My passion is for writing, editing, reading and ideas. I think we had a good combination of skills and experience that all came together really nicely to make a great team.